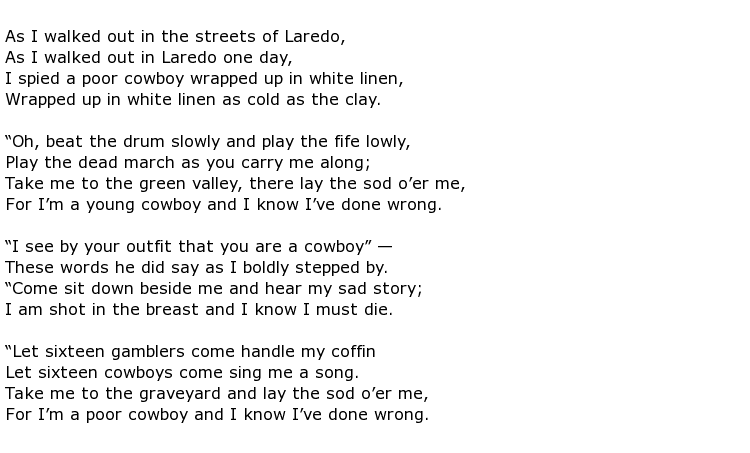 Frank Maynard was a poet and balladeer of the old American West whose major claim to fame is the reworking of a poem called The Cowboy’s Lament, also known (in song) as The Streets of Laredo. This tale was told and sung by cowboys and eventually was listed in the top one hundred Western songs of all time. 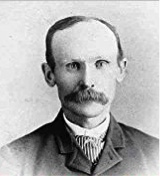 He enjoyed the wandering life of the old-time cowboy before settling down to get married at the age of 27, taking up employment as a carpenter and then building contractor in Colorado Springs. He never lost the art of the story-teller though and was usually known as Frank H. Maynard. In his memoirs he claimed to have known such legendary Western figures as Buffalo Bill Cody and Wyatt Earp. He was born Francis Henry Maynard on the 16th December 1853 in Iowa City, Johnson County, Iowa. He had no formal education to speak off and left home when he was sixteen years old, looking for new experiences wherever he might find them. These included joining a buffalo hunt a year later and he soon fell into the typical cowboy lifestyle. For example, during the year 1872 he joined a gang of drovers who were moving a herd of horses from Kansas to Texas. His next job was as a cowhand, driving a large number of cattle. This was a rough, uncompromising life and, at one point, he had to leave the drive having had his life threatened by another cowboy. Old resentments were still festering between men who had fought on opposite sides during the Civil War, and this was an example of one of those not uncommon situations. Maynard lived this life for nine years, jotting down his experiences whenever he could to be told as stories later on or turned into poems and songs. But then he turned his back on the nomadic life in favour of marital stability and a successful and financially rewarding venture as a carpenter. He and his wife joined the Colorado Springs Trinity Methodist Church and he was gradually accepted although not without some misgivings at first, due to his former cowboy life. He also began to write about his life and experiences, developing an old piece of work that he had begun to adapt around 1876. The Cowboy’s Lament became known and the author Jack London suggested that Maynard should write more pieces in a similar vein for publication in magazines to test their popularity before attempting to publish his work in book form. He then decided, in 1911, to go ahead with a book and he self-published Rhymes of the Range and Trail though it seems likely that this first effort was only distributed sparsely. Maynard still yearned for the cowboy life that he had enjoyed and, to be close to it, worked part time as a security guard at a Colorado Spring rodeo show. While there he met a university professor called Elmo Scott Watson at this time who wrote an article about Maynard suggesting that he may not have been exclusively responsible for the words of that famous song but, most certainly, was a contributor to his updating. Maynard’s literary output was relatively small but he certainly had a wealth of stories to tell, and he never tired of telling them despite a life of generally poor health which became much worse towards the end. This was no doubt caused by the rough, outdoor lifestyle endured on the open plains. Despite this though he lived beyond seventy years. Frank Maynard died on the 28th March 1926 at the age of 72.